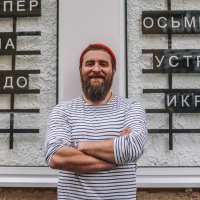 Maxim Polzikov is responsible for managing the Ginza Project which is running over 120 restaurants in Moscow, St. Petersburg, New-York, London, Tbilisi, Baku, and Geneve. Maxim is an entrepreneur and film producer, the soul of any company, an adherent of hospitality and an absolutely transparent business approach. His mission is to create the Ginza Project “Quality and Innovation” worldwide brand along with creating an effective and large-scale Ginza Investment Fund. For 15 years the Ginza Project has been implementing not only authentic restaurants but ambitious projects of integrated urban spaces development in cities with a million-plus population both in Russia and abroad. The company's projects were awarded the most prestigious awards, including “Gault&Millau Russia: Best International Strategy 2018”, “Business Traveller Awards and CIS Awards 2017”, “Luxury Lifestyle Awards Middle East & Africa 2016”, “Open Table Top 100 Restaurants 2016”, etc. Maxim is also a founder and brand-chef of one of the newest and the most successful projects of the Ginza Project – Rybtorg restaurant. For the past two years, Rybtorg has been steadily leading the ratings of the best seafood restaurants in Moscow.